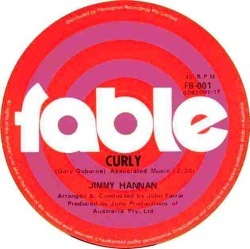 LEFT: "Curly" by Jimmy Hannan (FB-001, April 1970) the first Fable single. Ron Tudor's Fable Records was the most successful Australian independent recording company of the early 1970s. It was also one of the most productive 'indie' labels of the period, issuing over 300 singles and dozens of EPs and LPs. Fable made a big mark in 1970-71 scoring a string of hits by new Australian artists, and throughout its history the company discovered and promoted local talent. The company enjoyed further success between 1972 and 1975 through its subsidiary label Bootleg, which racked up a string of hit albums and singles with artists including Brian Cadd, the Bootleg Family Band and Kerrie Biddell. Fable and Bootleg released a wide variety of music from rock groups to mainstream vocalists; its catalogue also included theatre organ music, Christian gospel music by singing group The Proclaimers, comedy recordings by veteran entertainer Frankie Davidson, and occasional novelty items like Drummond's 'chipmunk' version of "Daddy Cool" and the quaint piano version of The Mixtures "In The Summertime" by film critic and honky-tonk piano virtuoso Ivan Hutchinson. Another Fable curiosity is the the single by Bert Newton and the Debney Park High School Band (the most recent Fable 45 we have located), a Xmas-themed release which reportedly reached #11 on the Melbourne charts. DPHSB drummer Bill Kio went on to become a professional musician and is now a member of Melbourne band The Wish. Fable also had a long association with VFL (AFL) football, beginning in 1972 when it released a series of official VFL football club songs (adapted from 'standards' like "Yankee Doodle Dandy"). These were widely used at matches and for TV and radio broadcasts, and can still occasionally be heard on Triple J's This Sporting Life during their annual AFL Grand Final calls. In 1979 Fable artist Mike Brady released "Up There Cazaly", which effectively became the AFL anthem; it sold a staggering 250,000 copies, becoming the biggest-selling Australian single ever released up to that time, a feat that earned it a place in the Guinness Book of Records. Company founder Ron Tudor (b. 1924) began his career in the music industry in the mid-1950s when he joined W&G as a sales representative, just as the company's new recording division was starting up. Over the next ten years he worked his way up through promotion to A&R and record production. Ron first recorded artists including Diana Trask, Ernie Sigley and The Seekers and was instrumental in getting The Seekers signed to W&G for their first recordings; he produced their first album, recorded just before the group left for the UK. After leaving W&G in 1966 Ron spent two years working at AstorRecords, and in 1968 he left to set up his own independent record production company, June Productions. A year later, in late 1969, he founded Fable Records with start-up capital of just $2. Tudor also established the Fable Music Publishing. Since its creation, many leading Australian artists have recorded songs published by Fable Music, including John Farnham, Slim Dusty, Rolf Harris, Judith Durham, Anne Kirkpatrick, Olivia Newton John, Brian Cadd, Debbie Byrne, Max Merritt, Margaret Urlich, Natalie Imbruglia, John St Peeters, Marcia Hines, Col Joye, Diana Trask, Jigsaw, Normie Rowe, The Bushwackers and Colleen Hewett. An important factor in Fable's initial success was Ron's association with the Nine Network TV talent quest New Faces. Ron was a member of the judging panel for several years, and among the prizes offered to heat and series winners was the chance to record with Fable. Many New Faces heat and series winners recorded for Fable and several became very successful -- Liv Maessen, John Williamson, Stephen Foster, Dutch Tilders and Franciscus Henri were all New Faces 'discoveries' who launched their recording careers with Fable. Fable was officially launched in April 1970 with a batch of five singles (all by Australian artists) and the success it enjoyed over its first nine months was nothing short of spectacular -- seven of its first twelve singles made the national Top 40, and of the forty-one singles Fable released between April and December 1970, seventeen became hits, including two national #1s (The Mixtures' "In The Summertime" and "The Pushbike Song") and four other Top 10 hits by Hans Poulsen, Liv Maessen, Jigsaw and John Williamson. Liv Maessen's version of "Knock, Knock, Who's There? ", which reached #2 nationally, was one of the most successful Australian singles of 1970, selling over 50,000 copies and earning Liv the first Gold Record ever awarded to an Australian female performer. John Williamson also earned a Gold Record for his debut single "Old Man Emu". Another remarkable Fable feat was that the label scored thirty-six charting singles in Sydney alone during 1970. Fable's second batch of singles, released in May, included The Strangers' "Melanie Makes Me Smile", John Williamson's "Old Man Emu" and Jigsaw's "To Love Means To Be Free", each of which became a hit. The Strangers and John Williamson both debuted on the Go-Set national chart on 18 July 1970, joining "Knock, Knock, Who's There", "Boom Sha La La Lo" and Pat Carroll's "All Kinds of Everything", giving Fable five singles in the national Top 40 in the same week! For several weeks in the period from July-October 1970, Fable was all over the Go-Set singles chart, with as many as seven singles simultaneously in the Go-Set Top 60. This included a joint #1 hit (shared with Mungo Jerry) with "In The Summertime", a #2 hit with "Knock, Knock, Who's There" and a #3 hit with "Old Man Emu". On the 3 October chart, there were five Fable singles simultaneously in the Top 20 -- The Mixtures at #1, Jigsaw at #3, John Williamson at #6, The Strangers at #16 and Liv Maessen at #17. Liv's new single "Snowbird" debuted the same week, giving her two simultaneous Top 40 hits. The critical factor in Fable's chart breakthrough was the controversial 1970 Radio Ban, which began in May 1970, a month after Fable was launched. The Ban was the climax of a simmering "pay-for-play" dispute between a group of record companies and the commercial radio sector. After Australia's new copyright laws were proclaimed in 1968, a group of major labels (EMI, Festival, Warner, CBS and Philips/Polygram) decided to scrap their long-standing agreement with commercial radio, dating back to the late 1950s, in which they had agreed to provide radio stations with free promotional copies of new singles and albums. The record companies demanded that a new royalty should be paid on all tracks played on air; radio not surprisingly balked at the idea of a new levy, which was set at 1% of the total annual revenue of the entire commercial radio industry. -- and when talks between the two parties broke down broke in April 1970 the 'gang' of labels placed a six-month embargo on the supply of free promotional records to commercial radio stations. The commercial stations responded by black-listing major-label product and refusing to list major-label titles in their Top 40 charts. Desperate for material, radio stations turned to smaller local companies like Fable and Sparmac, who had declined to take part in the Ban, and these enterprising independents made the most of this window of opportunity while it lasted. Fable in particular achieved considerable commercial success. During this time, Ron Tudor was being sent regular packages of new UK releases from London by his friend, former EMI house producer David McKay, and he optioned songs he thought would be suitable for his Fable acts. He had already scored a huge hit with the Liv Maessen version of Mary Hopkin's "Knock, Knock, Who's There? ", and when he offered The Mixtures "In The Summertime", a song that had recently been a UK hit for Mungo Jerry. the band jumped at the chance to record it -- although Idris Jones declined to sing on it, feeling it was too 'poppy', so bassist Mick Flinn performed the lead vocal. Fable's dream run continued through 1971. Early in the year it scored another Top 20 hit with a version of Cat Stevens' "Wild World", credited to the studio group Fourth House. This song (which competed with the Jimmy Cliff version) had been intended for Mike Brady (ex MPD Ltd), but an oversight during the recording of the backing track resulted in the song being pitched too high for Brady, so Ron Tudor called in former Wild Cherries lead singer Danny Robinson to overdub the lead vocal. A few weeks later The Mixtures' follow-up single "The Pushbike Song" became a major local and international hit -- it spent 12 weeks at #1 in Australia and also topped the charts in the UK, making it the first international hit to be entirely written, recorded and produced in Australia. Fable's next big hit came out of left field. In late 1970 Ron concocted another anonymous studio band, which he dubbed 'Drummond', which was in fact the members of Allison Gros (Graeham Goble, Russ Johnston and John Mower) and anonymous session players. They recorded a cover of George Harrison's "For You Blue" as Drummond's debut release. It made no impression, but the second Drummond single -- a novelty 'chipmunk' rendition of Slay & Crewe's "Daddy Cool" -- turned out to be one of the biggest Australian hits of 1971. Shamelessly cashing in on the popularity of the band Daddy Cool (who had included the song on their hugely successful debut LP), Drummond's version hurtled up the Go-Set national chart, reaching #1 in just six weeks and knocking Daddy Cool's "Eagle Rock" off the top spot in mid-September. It stayed at #1 for eight weeks, charted for 21 weeks and became one of the biggest-selling local recordings of the year. Fable was the launchpad for the solo career of singer-songwriter-keyboardist Brian Cadd (ex-The Groop, Axiom). Fable issued the Brian Cadd-Don Mudie duo single "Show Me the Way" in December 1971. It was a Top 40 hit, reaching #17 in February 1972 and charting for 12 weeks. In early 1972 Brian joined Fable as an A&R manager and house producer, and in this capacity he wrote, sang, played on and produced numerous Fable releases, including Robin Jolley's 1972 hit single "Marshall's Portable Music Machine" and Robin's debut album. Brian also produced Hans Poulsen's second solo album Lost and Found, Coming Home the Wrong Way Round (1972) and produced and/or played on Fable and Bootleg albums and singles by Stephen Foster, Fat Mamma, The Strangers, New Dream, Dutch Tilders, Bluestone, Kerrie Biddell and Daryl Somers. In late 1971 Tudor and Cadd set up Fable's new subsidiary imprint Bootleg. Brian had been inspired by the example of Leon Russell's Shelter label, and the way that Russell -- a former member of crack L.A. session team 'The Wrecking Crew' -- had organised a group of regular players around him for projects like Joe Cocker's Mad Dogs & Englishmen. In similar vein, Brian envisaged a regular Bootleg house band to back himself and all the other artists on the label, who he would also produce, for recording and touring. At the time, the roster included singer-songwriter Steven Foster, jazz vocalist Kerrie Biddell, and the harmony-pop group Mississippi. Bootleg quickly became the most successful independent record label in the history of Australian popular music, and it was rivalled in the long term only by Michael Gudinski's Mushroom. Over the next few years Brian Cadd earned many gold and platinum records as a solo artist and a swag of awards for film scores, title songs and TV themes, produced many other acts and wrote and produced some of Australia's most successful advertising music. His debut solo single "Ginger Man" (inspired by the J.P. Donleavy novel) established him as a major solo artist. It was a significant chart success, reaching #16 nationally on its release in October 1972 and charting for 18 weeks. His self-titled debut album reached #2, and spent 20 weeks on the album charts. Brian also won the composer's section of the final 1972 Hoadley's National Battle of the Sounds with one of the songs from the LP, "Don't You Know It's Magic". He performed it at the Tokyo World Popular Song Festival, where he won the 'Most Outstanding Composition' award; John Farnham recorded his own successful version in 1973. In 1973 Brian put together the Bootleg Family Band to back himself and other artists on recordings and for touring; the group included many of the best Melbourne session musos of the period including drummer Geoff Cox, who has played on scores of Australian hits. He also oversaw the BFB's own recordings, singing lead vocals and playing keyboards on their version of Loggins & Messina's "Your Mama Don't Dance", which was another major hit that year, reaching #4 and charting for 17 weeks. Brian's second album Parabrahm reached #5 nationally, and spawned a string of successful singles: "Every Mother's Son" (March), "Silver City Birthday Celebration Day" (July) and "Keep on Rockin'" (October). The next single "Alvin Purple" (November) was the theme song from Tim Burstall's feature film of the same name. Brian wrote the score for both Alvin Purple (1973), and its sequel Alvin Rides Again (1975). There were more hits through 1974 ­ the LP Moonshine (#16 in September), and the singles "Class Of '74" (April), the theme song from the TV series of the same name, "Let Go" (#14 in September) and "Boogie Queen" (December). By this time Brian had signed an American distribution deal and both Parabrahm and Moonshine came out on Chelsea Records in the USA and he toured the USA with the Bootleg Family Band during 1975. Fable continued to score hits through 1972-73, including Matt Flinders' "Butterfly" (#4) Robin Jolley's debut single "Marshall's Portable Music Machine" (a #4 hit written and produced by Brian Cadd), The Mixtures "Captain Zero" (#5), the theme song from Bruce Beresford's The Adventures of Barry Mackenzie performed by veteran 'trad' jazz singer Smacka Fitzgibbon (#21), Jigsaw's "Mademoiselle Ninette" (#20) and Johnny Chester's perennial Mother's Day tribute, "The World's Greatest Mum" (#9). This was the last major Fable hit for some time, but the label bounced back in early 1975 with Bill & Boyd's "Santa Never Made It Into Darwin", which was inspired by the disaster of Cyclone Tracy and went to #1. The duo had further success with their next single, the defiantly sexist "Put Another Log On The Fire". When Brian Cadd moved to the USA in 1976, Bootleg lost its main creative force and its fortunes rapidly waned. By this time enormous changes had taken place on the music scene -- Go-Set magazine had folded, colour TV had been introduced, the ABC's Countdown was ushering in the music video era and the new rock station 2JJ in Sydney was becoming a major new force in radio. Other local record companies were also eating into Fable's market share, notably Michael Gudinski's Mushroom label, which had shot to prominence in early 1975 with the record-breaking success of Skyhooks. In the late 70's, together with other music industry leaders and key musicians Ron spearheaded the Australian Music Makers Association which lobbied government, lead rallies and media focus all around the country for an increase in the quota of Australian music on commercial radio. Over the course of three years Ron spent many hours in Australian Record Industry Tribunal hearings lobbying on behalf of the Australian Music Industry. His time and effort paid off for the industry with the quota being increased from 5% to 20% over a number of years. When interviewed about the Radio Ban for a feature article by Toby Creswell, published in The Australian several years ago, Ron Tudor stated that although his refusal to take part in the Ban had helped to launch the label, it had damaging long-term consequences, and he claimed that Fable had been unofficially 'blackballed' by the major labels, with the result that his business was effectively strangled by the problem of getting its records distributed. The company struggled on into the early 1980s, scoring one last massive hit in 1980 with Mike Brady's VFL anthem "Up There Cazaly", the HSV-7 football theme song. Ron eventually sold Fable to John McDonald's Image music group in 1984 and the combined companies have since been relaunched as Fable Music. Fable won many industry awards during its fifteen-year life. At the end of 1971 Fable won the Go-Set Pop Poll Professional Non-Performers award for the biggest contribution to the Australian Pop Industry by an individual or company. In 1972 Fable and Bootleg between them won eight of the sixteen awards given out by the Federation of Australian Commercial Broadcasters, including a Special Award of Merit for services to the industry. By the end of his association with Fable in July 1984, the company had amassed 20 gold and platinum records and 32 industry awards. In 1974 Ron Tudor received the first Moomba Music Industry award, presented to the person who has contributed significantly to the development of the Australian record and music industries. Other accolades include the 1979 Radio 3MP "Gull Award" for Outstanding Contribution to the Australian Music Industry, the 1980 Advance Australia Award for "Outstanding Contribution to the Recording Industry and Contribution to the Advancement and Enrichment of Australia, its people and way of life", the 1992 Yamaha Award for Outstanding Contribution to the Development of Australian Music and Musicians over the past 35 years and in 1996 APRA awarded Ron the Ted Albert Memorial Award for Significant Contributions to the Australian Music Industry. All Fable and Bootleg singles and EPs were catalogued in the same numerical series, which started at "001", so numbering for each label is not always consecutive. Fable singles were prefixed "FB" and EPs were prefixed "FBEP", while Bootleg singles and EPs were prefixed "BL" and "BLEP". Fable and Bootleg LPs (which were all issued in stereo) were similarly catalogued in their own series, also beginning at "001" -- Fable titles were prefixed "FBSA" and Bootleg titles were prefixed "BLA". The Milesago page on Bootleg lists all the known releases on that label. Curiously, almost all the Fable and Bootleg EPs were issued in two batches -- eight Fable EPs were released simultaneously in January 1973, and a mixed batch of two Fable and two Bootleg titles was issued in August that year. Some Fable releases were titles licenced from overseas companies and issued under the "Fable International" banner, although it appears that there were only a handful of these releases, notably those by Phildelphia soul band Brenda & The Tablulations and American actor Dennis Weaver. FB-003 Apr. 1970 Carrl & Janie Myriad A: "Last Saturday"
FB-004 Apr. 1970 Pat Carroll A: "All Kinds of Everything"
FB-005 Apr. 1970 Liv Maessen A: "Knock Knock, Who's There"
FB-006 May 1970 Owen Yateman's Mob A: "Ice Cream"
FB-007 May. 1970 Mike Brady A: "Finger Poppin' "
FB-008 May. 1970 John Williamson A: "Old Man Emu"
FB-009 June 1970 Bill & Boyd A: "It's a Small World"
FB-010 May 1970 Jigsaw A: "To Love Means to Be Free"
FB-011 May 1970 The Strangers "Melanie Makes Me Smile"
FB-012 May 1970 Johnny Chester "If only I could leave you"
FB-013 June 1970 Frankie Davidson "Gimme Dat Ding"
FB-015 unreleased The Rebels "Can you make it on your own"
FB-017 July 1970 The Mixtures "In The Summertime"
FB-018 July 1970 Jigsaw "Yellow River"
FB-019 July 1970 Edwin Duff "Wait For Tomorrow"
FB-020 Aug. 1970 Smacka Fitzgibbon "Waterloo Road"
FB-021 Aug. 1970 Liv Maessen "Snowbird"
FB-022 Aug. 1970 Jimmy Hannan "Thanks"
Franciscus Henri "Mary and me"
"Were you there, were you ever"
FB-024 Sep. 1970 Keith Humber "It Wasn't Enough"
FB-025 Sep. 1970 Bobby & Laurie "Through The Eyes Of Love"
FB-026 unreleased Vehicle "Time and Love"
FB-027 Sep. 1970 Doug Parkinson In Focus "Purple Curtains"
FB-028 Oct. 1970 Rory O'Donoghue "The Race"
FB-029 Oct. 1970 Hans Poulsen "Light Across The Valley"
FB-030 Oct. 1970 The Delltones "Give Me Some Loving"
FB-031 Oct. 1970 Peter McKenna "Things to remember"
FB-032 Nov. 1970 Matt Flinders "All Of A Sudden". FB-033 Nov. 1970 John Williamson "Under the bridge"
FB-034 Nov. 1970 Terry Walker "Natural Sinner"
FB-035 Nov. 1970 Fourth House "Wild World"
FB-036 Nov. 1970 Mike Brady "Sympathy"
FB-037 Dec. 1970 The Strangers "Mr. President"
FB-038 Dec. 1970 Bulldog "Man of Constant Sorrow"
FB-039 Dec. 1970 The Mixtures "The Pushbike Song"
FB-040 Dec. 1970 Johnny Chester "Kawliga"
FB-041 Dec. 1970 Cassie James "Which way are you going Billy"
FB-042 Feb. 1971 James Royal "Carolina"
B: The Midnight Ramblers "Waltzing Matilda"
FB-044 Dec. 1970 Frankie Davidson "Thank you very much"
FB-045 May 1971 The Hawking Brothers "Sha-la-la I need you"
FB-046 unreleased The Morningtown Strings "A world of our own"
FB-047 Feb. 1971 John Williamson "Beautiful Sydney"
FB-048 Mar. 1971 David Holmes "Denver Idleman"
FB-049 Mar. 1971 Stephen Monaham(n?) "The Flying Machine"
FB-050 Feb. 1971 Dawn Dixon "Bouzouki"
FB-051 Mar. 1971 Jigsaw "Albert the Albatross"
FB-052 Mar. 1971 Johnny Chester "Glory Glory (I'll Be Back To See The Storey Bridge)"
FB-053 Mar. 1971 Liv Maessen "Hurry On Down"
FB-054 May 1971 Alison Gros "If I Ask You"
FB-055 Apr. 1971 Hans Poulsen "Stick of Incense"
FB-056 Apr. 1971 The Colonials "Put a light in every window"
FB-057 Apr. 1971 Frankie Davidson "The Ball Bearing Bird"
FB-058 Apr. 1971 Matt Flinders "How great thou art"
FB-059 May 1971 The Proclaimers "God is standing by"
FB-060 Apr. 1971 Ross D. Wyllie "He Gives Us All His Love"
FB-061 May 1971 The Strangers "Sweet Water"
FB-062 May 1971 The Mixtures "Henry Ford"
FB-063 May 1971 Franciscus Henri "All I want"
FB-064 May 1971 Candy Grants Team "Sweet Mary"
FB-065 June 1971 Mike Brady "Oh Lord, Why Lord"
FB-066 June 1971 Jimmy Hannan "Money Money"
FB-067 June 1971 John Farrar "With Rainee on my mind"
FB-068 June 1971 Smacka Fitzgibbon "A little bit of this"
FB-069 June 1971 The Midnight Ramblers "American Patrol"
FB-070 June 1971 Drummond "Daddy Cool"
FB-071 Aug. 1971 Brenda & The Tabulations (USA) "Right on the Tip of My Tongue"
FB-072 Aug. 1971 Bill and Boyd "Schwabadaba Ding Ding"
FB-073 Nov. 1971 Bobby and Laurie "I'm Gonna Be A Wheel Someday"
FB-074 Nov. 1971 Julian Driscol "Wishbone"
FB-075 Sep. 1971 Og & The Joggers "Zap Pow"
FB-076 Aug. 1971 Johnny Chester and Jigsaw "Gwen Congratulations"
FB-077 Aug. 1971 Matt Flinders "Butterfly"
FB-078 Sep. 1971 The Proclaimers "Jesus Christ, what a man"
FB 079 Sep. 1971 Jigsaw "So I Tell You"
FB-080 Sep. 1971 Hans Poulsen "Sweetest Girl I've Ever Seen"
FB-081 Aug. 1971 Ross D. Wyllie "It Takes Time"
FB-082 Oct. 1971 The Mixtures "Never Can Be Untrue"
FB-083 Oct. 1971 Liv Maessen "Here I go again"
FB-084 Mar. 1972 Peter Moesser "Hello"
FB-085 unreleased Ricky Shane "Ginny come to me"
FB-086 Dec. 1972 Lovers Dream "Party Line"
FB 087 Dec. 1971 Alison Gros "All The Days"
FB-088 Nov. 1971 The Mixtures "Captain Zero"
FB-089 Jan. 1972 Drummond "You Talk Too Much"
FB-090 Nov. 1971 Bob Bradburn "Count Your Blessings (Letter To Santa)"
FB-091 Nov. 1971 Brian Cadd and Don Mudie "Show Me the Way"
FB-092 Oct. 1971 Liv Maessen & Jimmy Hannan "Love is for the two of us"
FB-093 Dec. 1971 Matt Flinders "You"
FB-094 Dec. 1971 Hans Poulsen "Stork's Song"
FB-095 Dec. 1971 The Proclaimers "One more mountain to climb"
FB-096 Jan. 1972 Johnny Christie "Sorry is my name"
FB-097 Jan. 1971 Dawn Dixon "Hand In Hand (Side By Side)"
FB-098 June 1972 Hans Poulsen "Meet Me In The Valley"
FB-099 Dec. 1971 Johnny Chester & Jigsaw "Shame and scandal (in the family)"
FB-100 Jan. 1972 Homer "Ol' Blue Jeans"
FB-101 Jan. 1972 Michael Holm "I will return"
FB-102 Jan. 1972 Frankie Davidson "Everyday family man"
FB-103 Feb. 1972 Smacka Fitzgibbon "Honey Pie"
FB-104 Mar. 1972 Mike Brady "Hello Mum"
FB-105 Feb. 1972 Jigsaw "How Do You Do"
FB-106 Mar. 1972 John Williamson "Misery Farm"
FB-107 Mar. 1972 Brenda & The Tabulations "Why didn'ty I thik of that"
FB-109 Mar. 1972 Robin Jolley "Marshall's Portable Music Machine"
FB-110 Mar. 1972 Liv Maessen "New Love Day"
FB-111 Apr. 1972 Mary Jane Boyd "Love is life"
FB-112 Apr. 1972 Fat Mumma's Big Boozas Bad News Blues Band "Goodbye Forever"
FB-125 1972 Johnny Chester & Jigsaw "Readymix Revenge"
FB-126 1972 Mike Preston "Why"
FB-127 May 1972 James Royal "White cliffs of Dover"
FB-128 May 1972 Jimmy Hannan "May each day"
FB-129 June 1972 Matt Flinders and Mary Jane Boyd "A star for you and me"
FB-130 May 1972 Ross D. Wyllie "Sweet White Dove"
FB-131 June 1972 Dennis Weaver (USA) "No name"
FB-132 June 1972 The Proclaimers "All his children"
FB-133 July 1972 Franciscus Henri "Turn you around"
FB-134 July 1972 The Strangers "Tennessee"
FB-137 Aug. 1972 Jigsaw "Mademoiselle Ninette"
FB-139 Aug. 1972 Geoff Hales conducts the Fable Strings "Peace love and joy"
FB-140 Sep. 1972 Johnny Chester and Jigsaw "Midnight Bus"
FB-141 Sep. 1972 Robin Jolley "Where's The Music Playing"
FB-142 Oct. 1972 Matt Flinders "Home"
FB-144 Nov. 1972 The Hearts of Soul "It's great fun"
FB-145 Nov. 1972 John Williamson "Big Country Round"
FB 146 Nov. 1972 Drummond "Singin' The Blues"
FB-147 Nov. 1972 Liv Maessen "A Taste of Money"
FB-148 Nov. 1972 Matt Flinders "I love you the way you are"
FB-149 Nov. 1972 Hans Poulsen "Sleepy Town Girl"
FB-150 Nov. 1972 Franciscus Henri "Ding dong who rang the bell"
FB-154 unreleased Bill & Boyd -"Slap your draughty blue jeans"
FB-156 1972? The Hawking Brothers "Catfish John"
FB-166 Jan. 1973 Merrilyn Lambert "I am what I am"
FB-168 Mar. 1973 Roatation "Goody My Love"
FB-172 Apr. 1973 Bill & Boyd "Someone to love"
FB-174 May 1973 Liane Syme "You are the reason"
FB-175 Apr. 1973 Jigsaw "Singalong"
FB-176 June 1973 Glen Yarbrough "Annie's going to sing her song"
FB-177 May 1973 Alexander Curly "I'll never drink again"
FB-179 May 1973 Kerrie Biddell "If I be your lady"
FB-180 June 1973 Johnny Chester "The World's Greatest Mum"
FB-182 June 1973 The Hawking Brothers "A good love is like a good song"
FB-184 June 1973 Ted Hamilton "Get on with your livin'"
FB-186 July 1973 Matt Flinders "I watched you walk away"
FB-190 July 1973 Robin Jolley "Do Ya Wanna Boogie"
FB-191 Aug. 1973 Terry Donovan "Loose ends"
FB 192 Aug. 1973 Jigsaw "Clap Your Hands"
FB-193 Sep. 1973 Smacka Fitzgibbon "Everybody wants to go to heaven"
FB-194 Sep. 1973 Matt Flinders "The last blues song"
FB-195 Oct. 1973 Bluestone "The singer sang the song"
FB-196 Oct. 1973 The Hawking Brothers "The Melbourne Cup"
FB-198 Nov. 1973 Ivan Hutchinson and his Honky Tonk Piano "The Pushbike Song"
FB-199 Nov. 1973 Bernd Cluver "Mouth Organ Boy"
FB-200 Oct. 1973 Johnny Chester "Let's Build A Love Together"
FB-202 Nov. 1973 Peter Henn "Flip-flap"
FB-203 Feb. 1974 Axiom "A Little Ray of Sunshine"
FB-204 Dec. 1973 Karisma "Clap your hands and stamp your feet"
FB-205 Jan. 1974 Jigsaw "Sunday Girl And You"
FB-207 Mar. 1974 John Williamson ""W-w-wallaby"
FB-208 July 1974 The Mixtures "Love is life"
FB-209 Sep. 1974 Glenn Stevenson "Pretend"
FB 210 Feb. 1974 Robin Jolley "Song And Dance Man"
FB-211 Mar. 1974 Johnny Chester "She's my kind of woman"
FB-212 Mar. 1974 The Hawking Brothers "Chattanoogie Shoshine Boy"
FB-213 Apr. 1974 Bill and Boyd "Aussie"
FB-215 Apr. 1974 Denise Morrison "No charge"
FB-217 Sep. 1974 Sally Finch "Let's start the whole world singing"
FB-218 June 1974 Jigsaw "A Rose Has to Die"
FB-222 July 1974 The Hawking Brothers "Julianna"
FB-224 Oct. 1976 Phil and John "Hello Mary Lou"
FB-225 Aug. 1974 Robin Jolley "My Happy Song"
FB-226 1974 Johnny Chester "My Special Angel"
FB-227 Sep. 1974 Denise Morrison "Hello out there"
FB-228 1974 Ronald & Donald "Quack Quack"
FB-229 Nov. 1974 The Hawking Brothers "Slippin' and slidin'"
FB-232 Dec,. 1974 Jigsaw "Light Up The World"
FB-235 Jan. 1975 Dean Stewart "Devil in the bottle"
FB-236 Feb. 1975 Smacka Fitzgibbon "Dong dong daddy from Dumas"
FB-237 June 1975 The Proclaimers "On the wings of a dove"
FB-238 June 1975 Liv Maessen "Everybody's reaching out for someone"
FB-239 Feb. 1975 Johnny Chester "Sally on Sunday"
FB-240 Feb. 1975 Luigi Risotto ""Tie me kangaroo down sport"
FB-241 Feb. 1975 Bluestone "Hear the bang"
FB-242 Apr. 1975 Bill and Boyd "Union Silver"
FB-244 unreleased Matt Flinders "Before you go to sleep"
FB 245 Mar. 1975 Drummond "The Bump"
FB-246 Mar. 1975 Benny Christian "Beer Barrel Polka"
FB-247 Apr. 1975 The Hawking Brothers "Australian Rules"
FB-248 June 1975 Terry Dean "Runaround Sue"
FB-250 June 1975 The Fable Brass "Twelfth Street Rag"
FB-252 July 1975 Johnny Chester "The one in the middle of lonely"
Fb-253 July 1975 Patricia Stephenson "Sometimes"
FB-254 Oct. 1975 Denise Morrison "Baby doll"
FB-255 May 1976 Timmy "I hope it's gonna sell a million"
FB-257 Sep. 1975 Bill and Boyd "Put Another Log on the Fire"
FB-259 Nov. 1975 Jigsaw "Teach Me How To Rock N Roll"
FB-260 Nov. 1975 The Paul McKay Sound "Take Me Where The Music's Playing"
FB-263 June 1976 The Hawking Brothers "Truck driver's lament"
FB-265 Feb. 1976 The Set "Draggin' The Line"
FB-267 1976 Johnny Chester "She's gone"
RB-268 Mar. 1976 Bandicoot "Living off the radio"
FB-270 May 1976 Denise Morrison "Tar & Cement"
RB-271 Apr. 1976 Cash Backman "Caroline"
FB-275 July 1975 The Walkers "I'm sorry"
FB-276 July 1976 Patricia Stephenson "Bye bye mama"
FB-277 June 1976 Bill and Boyd "Question"
CC-278 June 1976 Stylus "So much love"
RB-279 June 1976 Normie Rowe "Mother's Boy"
CC-280 unreleased Springwater "Peggy Sue"
FB-282 July 1976 The Memories "What ya gonna tell your mama"
RB-285 Sep. 1976 Saltbush "Whatcha gonna do"
FB-286 Aug. 1976 Smacka Fitzgibbon "I've got them feelin' too good today blues"
FB-290 Nov. 1976 The Mixtures "The Pushbike Song"
FB-317 - Disco Bouzouki Band "Disco bouzouki"
FB-336 Blaze "The Rutherford Red"
FB-337 - Karen Knowles "Why won't you explain"
FB-339 1981 Johnny Chester "My Ding-A-Ling"
FB-342 - Karen Knowles "You are the reason"
FB-344 - Karen Knowles "I Never Said I Love You"
FB-345 - Bert Newton and the Debney Park High School Band "Bring back the spirit of Xmas"
Produced by Peter Best, arr. Peter Jones. FBSA-027 1972 Franciscus Henry Ding Dong Who Rang The Bell? Please email webmaster@milesago.com if you have more information, corrections or new links, or to report any broken links on this page.